How they got here: Fifth-seeded RIT had a first-round bye and eliminated fourth-seeded Sacred Heart in the quarterfinals by winning Game 1, 9-4, losing Game 2, 7-3 and winning Game 3, 3-1. 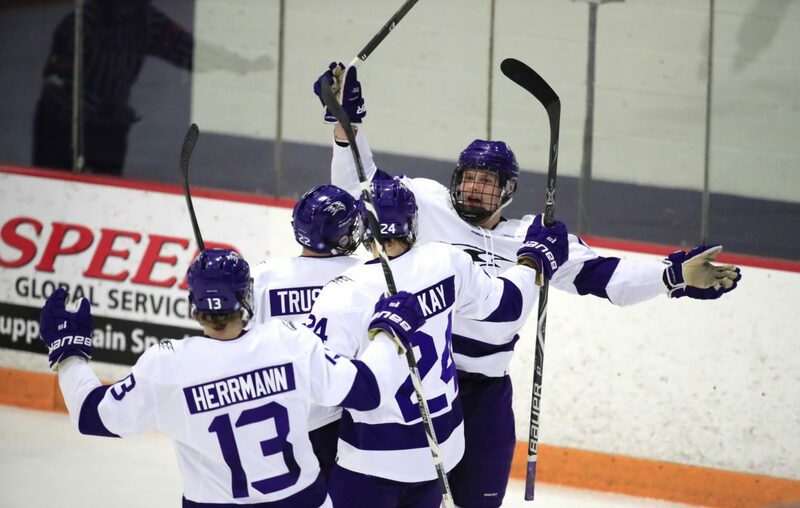 Sixth-seeded Niagara beat Canisius in three games in the first-round, with a 5-4 overtime win in Game 1, a 4-3 overtime loss in Game 2 and a 2-1 win in Game 3. Niagara then upended third-seeded Air Force in consecutive games, 3-2 and 5-4, to reach the semifinals. History: This will be the fifth meeting of the season between the teams, with RIT winning the series, 2-1-1. Niagara’s lone win was in the most recent game, 4-2 on Feb. 27. Niagara leads the all-time series, 19-12-14. This is the fourth postseason meeting, with the most recent coming in the first round in 2017. Niagara ousted RIT in three games in 2017 in the first round and in two games in 2014 in the quarterfinals. RIT won, 2-1, in the semifinals in 2012. Overall, Niagara has a 4-2 lead in the postseason. New home: The tournament moves to Harborcenter after the last 12 years at Blue Cross Arena in Rochester. Tight games: Of Niagara’s last nine games, six have been decided by one goal. There have been two ties and one game was a two-goal margin. Five of the Purple Eagles’ last eight games have gone to overtime for a total of 49:35 played. Star freshman: Ludwig Stenlund is Niagara’s team leader in points after he had two goals and three assists in the two games against Air Force. Stenlund was the nation’s top freshman in goals (19), points (34), power play goals (9) and power play points (15) and shorthanded goals (3). The three shorthanded goals were tied for the most among all skaters in Division I. Scoring prowess: Niagara is No. 11 in Division I in scoring offense at 3.23 goals per game. RIT is 20th at 3.05 per game. On defense, RIT is No. 36 in goals allowed per game at 2.97. Niagara is 53rd among the 60 Division I teams at 3.49. RIT names to know: Erik Brown leads RIT in goals with 18. Abbott Girduckis is the team leader in assists (25) and points (36). Goaltender Logan Drackett was third in Atlantic Hockey during the regular season in goals against (2.58). Next: The winner advances to the Atlantic Hockey championship game at 7:30 p.m. Saturday at Harborcenter against the winner of the No. 1 seed American International vs. No. 8 Robert Morris semifinal (Friday, 4:35 p.m.). The championship game winner receives an automatic bid to the NCAA Tournament. The NCAA bracket is being released Sunday at 7 p.m.